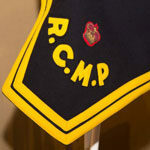 1883– Members of the NWMP have had to endure severe weather conditions in the course of their duties. But this day in Prince Albert, Saskatchewan sets a new record when the mercury drops to a bone chilling -56.7 degrees Celsius. 1915– Like so many of his peers #5685 Cpl. Michael O’Leary obtained a discharge from the NWMP so he could serve in WW1with “A” Company of the Irish Guards. On this day while fighting at Cuinchy, France, 26-year-old Lance-Corporal O’Leary rushed a German machine gun position and killed five Germans who were holding the first barricade. Then he attacked a machine gun position 60 yards further on killing three more enemy soldiers and taking two others prisoner. His valour resulted in him being awarded the Victoria Cross and a promotion to Sgt. and then he was transferred to the Connaught Rangers and promoted, to 1st. Lieutenant. His heroism was again recognized when he was serving in Salonika and he was awarded the Russian Cross of St. George. After ending the war as a Captain, he eventually returned to Canada with his wife Margaret Hegarty, where he became an Inspector in the Ontario Provincial Police. In 1925 they went to Michigan, USA, and he joined the Michigan Central Police. Eventually he returned to England. In WW2, he served with the Middlesex Regiment and retired at the end of the war as a Major. He died in England in 1961 and is buried in Paddington Cemetery. 1920– The Royal North-West Mounted Police becomes the Royal Canadian Mounted Police and assumes the responsibility of enforcing federal laws in all nine Provinces and both territories, instead of only the four western provinces. The new Force absorbs the Dominion Police, which had guarded government buildings and enforced federal statutes since 1868. The headquarters of the new Federal Police Force is moved to Ottawa while training stays in Regina. The size of new Force is set at 2,500 men. 1935– International Pictures release the movie “SILENT CODE” staring Kane Richmond as RCMP Corporal Jerry Halea Mountie who is reassigned to a district he had been run out of earlier forcing him to leave his girlfriend and be accused of murder. 1940– #12647 Constable Hans William Metcalfe was promoted to Lance Corporal for his bravery in attempting to arrest an insane man in the Yukon. Metcalfe served from 1935 to his death while serving as a Corporal in Swift Current Saskatchewan on May 21, 1951. 1961– 20th-Century Fox releases the movie “The Canadians” in DeLuxe Color. The hero of the flick is Inspector William Gannon starring Robert Ryan who has to deal with the problems created when the Sioux come to Canada. He lets then stay if they promise to be peaceful, but cowboys kill all inhabitants of one of their villages and create problems for the Mounties. 1962 -#14037 Staff Sergeant Major J.E. Fernand Roy received a commendation for an Excise Act investigation in which resulted in the seizure of an illicit still and 800 gallons’ alcohol. He served from 1941 to 1964 & died on October 3rd, 1997 at St Laurent, Que. 1919– Former Mountie discharged from the Army for being underage! #7148 Cst. Forest Calvert Miles who served in the RNWMP for a year joined ‘A’ Squadron Cavalry Draft on May 1st, 1918 during World War I and was assigned CEF #2684252. Eight months later someone discovered that Private Miles wasn’t 18 years old and therefore not old enough to serve in the Army, so he was discharged for being under age. 1936– Metro Goldwin Mayer releases the classic of all Mountie Movies “Rose Marie” starring Jeanette MacDonaldand Nelson Eddy as Sgt. Bruce. 1958– #16864 Constable Robert Nichols earned a Commissioners Commendation for thwarting a bank robbery in Toronto. Nichols was in the bank in plain clothes when the robbery occurred and followed the three robbers out onto the street and confronted them. A gun battle occurred and Cst. Nichols succeeded in wounding one of the fleeing men. The culprits were later caught and arrested. 1968– #18391 S/Sgt Richard J. DeMeriez (served 1953 to 1981) became the first RCMP pilot to fly the Forces new Turbo Beaver C-FMPA. 1986– While on Patrol in Nanaimo BC, Constables #31252 Ian G. Duncan and #31620 Gregory A. Young were crossing the Pearson Bridge and observed a car floating 25 feet from shore in the Mill Stone River. Recognizing that the elderly driver was trapped inside the vehicle with water up to his neck, the two policemen removed their outer clothing and dove into the frigid water and swam out to the car. After trying in vain to open the doors to reach the unconscious man, they obtained an axe from some onlookers and smashed out the driver’s side window. Though exhausted and suffering from hypothermia the two constables pulled the driver out and assisted by a citizen succeeded in getting the man to shore where he was revived by ambulance personnel. For their efforts in saving the drivers life both, men were awarded the Commissioners Commendations for bravery. 1932 – Honour Roll Number 51. #9669 Constable Edgar Millen age 31 was killed near Rat River, N.W.T., while attempting to apprehend Albert Johnson. Cst. Millen was a casualty in one of the most famous manhunts in Canadian History; the hunt for “the Mad Trapper of Rat River”. By the time the ordeal was over a policeman and a soldier would be shot and wounded, Cst. Millen would be killed, and the murderer tracked for six weeks through the bush aided by a WW1 flying Ace. Trapper Albert Johnson was a reclusive American who had appeared in the Yukon in 1927 and had his first encounter with the policeman he would later kill when he arrived in Fort McPherson in July 1931. Johnson brought attention to himself because of his elusiveness and eccentric behavior and the fact that he was spending enormous amounts of cash. Constable Edgar Millen the commander of Arctic Red Detachment decided to check out the newcomer and after an interview that consisted mostly of vacant stares and few words; Millen advised Johnson that if he was going to trap in his detachment area, he would require a trapping licence. It didn’t take long for Johnson to scare off the locals and in December local Indians came to the detachment and reported that Johnson had destroyed their traps and threatened to kill them if they didn’t leave his trapping area. On December 26thCst. Millen then sent his two men the eighty miles to Johnson’s cabin to investigate. After constables #10211Alfred Wheldon “Buns” King and Special Constable Joseph Bernard arrived two days later, they found a fortified cabin that was dug three feet into the ground and equipped with peep holes to shoot out of. Even though smoke was coming out of the cabin, Johnson refused to answer the door, so the men decided to travel 80 miles to the RCMP Headquarters in Aklavik and obtain a search warrant. Inspector #5700/O.209 Alexander Neville Eames issued the warrant and then ordered Constables #10269 G. Robert McDowell and Special Cst. Lazarus Sittichiulis to return to the scene with the other two men and arrest Albert Johnson. The four men arrived back at the fortified cabin on December 31st,but the trapper still refused to respond to their calls. When Cst. King approached the cabin door to serve the Search Warrant, Albert Johnson shot him in the chest through a peephole. As the other three men opened fire on the cabin, they managed to pull their wounded comrade to safety and then rushed him to the All Saints Mission back in Aklavik and miraculously he survived. On January 5th, 1932 eight policemen and seven trappers returned to the scene armed with guns and 20lbs of dynamite and after a 15-hour siege involving heavy gunfire and blowing off part of the cabin roof Albert Johnson was still alive and shooting. Running low on supplies the men decided to return to Aklavik and came back eleven days later with a posse of 21 men. Upon their arrival, the police discovered that Johnson had fled the scene and was headed towards the Alaskan border. Refusing to be deterred, Inspector Eames equipped a squad of four men led by Constable Millen with enough supplies to last nine days and with the thermometer reading 50 below zero they set out to pursue the fugitive. When the men caught up to Johnson a gunfight occurred and Cst. Millen was killed by a shot from Johnson’s high-powered rifle. After Millen’s body was returned, the manhunt became a national story and the search for the Mad Trapper of Rat River gained a new intensity. Canada’s war hero Wilfred “Wop” May, the ace who had challenged the Red Baron in France was brought in from Edmonton over 1000 miles away with his Bellanca airplane and hired to lead an aerial search. With the bush pilot’s assistance, the posse closed in on Johnson on February 17th and in the shootout, that followed Albert Johnson was riddled with bullets. The story of the hunt for Albert Johnson was made into a best-selling book “The Death of Albert Johnson, Mad Trapper of Rat River”. Even Hollywood got in on the act when in 1981 they released the movie “Death Hunt” starring Lee Marvin as Millen and Charles Bronson as Albert Johnson. Using poetic licence they promoted Millen to sergeant and subtitle the movie as “the saga of two rivals who clash as enemies and triumph as heroes”,The movie tells how a reluctant Lee Marvin is forced to pursue Charles Bronson in the manhunt across the Canadian wilderness. Edgar Millen a native of Belfast Ireland was initially buried in Aklavik but on February 29, 1932 he was re-interred with full military honours at the Beechmont Cemetery in Edmonton Alberta. 1964– A terrorist group calling itself “Comité révolutionnaire du Québec” raid the armoury in Montreal and steal weapons and ammunition. 1970– At approximately 11:00 p.m. #18044 Corporal William R. Colvin was conducting a routine patrol on the Trans-Canada Highway near Regina when he encountered a 16-year-old boy hitchhiking. When he questioned the lad, he discovered that he was a runaway from Hope, British Columbia. He had the boy get in his car and was returning him to Regina when suddenly the boy produced what Colvin though was a .45 revolver and pointed at him and ordered him to stop the car. Instead of easing the car to a stop Cpl. Colvin slammed on the brakes while traveling at over 60 miles per hour and wrestled the gun from the youth’s hand. In recognition of his courage and determination in safely disarming the assailant Cpl. Colvin was awarded the Commissioners Commendation for Bravery. 1971 – Often stories of heroism seldom get told let alone recognized with an award. One such incident involving #25593 Constable Brian Shouldice of Frobisher Bay, NWT was noted by Mr. Justice W.G. Morrow in and article he wrote in 1975, entitled “Courage in Red”. In his article, he commended several constables he had encountered in his career as a judge including Cst. Shouldice who had responded to complaint of a break and enter. When he walked into the house, he was confronted by an intoxicated man who was lying on the floor pointing a rifle at him and threatening to kill him. Cst. Shouldice quickly removed himself from the house and then set up surveillance. Instead of confronting the drunken man left the building with the rifle, he followed him at a safe distance and when the gunman tripped and fell, Shouldice rushed him and grabbed the .303 hunting rifle. When he examined it, he discovered that the bolt was missing. Even though the weapon was harmless, Cst. Shouldice had no way of knowing that. The judge noted that individual courage and restraint that he demonstrated, exemplified the professionalism of many members of the Force who deal with situations like this on a regular basis. 1941–#13375 Constable Brian Patrick Barry O’Callaghan while serving as a Private in the Number 1. Provost Company in England was granted a testimonial from the Royal Canadian Humane Association, for saving the life of Maurice I. Henning who was drowning in the Harmon River on near Nampa Alberta on January 29th, 1941. Constable O’Callaghan joined the Provost Company in the thirteenth draft in October 1941. 1985 –New Brunswick Premier Richard Hatfield found not guilty in provincial court in Fredericton NB of possession of marijuana. The drug was discovered by #25087 Cpl.Eugene Hoffman in his personal suitcase that was on the Queens plane during Royal Visit security search Sept 25th in Moncton NB. Premier Hatfield claimed it was planted. 1965 – Canada receives Royal Proclamation replaces the Red Ensign with the new Maple Leaf flag as the official flag of Canada. 1976 –Constables #24609 John Hay and #30669 Louie S. Racz responded to a call for assistance at a farm near Yorkton, Sask. Shortly after they entered the house a very agitated and emotionally charged man came in brandishing a loaded high-power rifle. Though the man was acting irrationally and at times incoherently, the two policemen managed to calm him down enough that he laid down the rifle. In recognition of their actions, both constables were awarded Commanding Officers commendations. 1988 –Sergeants, #23868 Dale E. Dichrow and #25825 Thomas M. Wagner earned Commissioners Commendations and Commendations from the Vancouver City Police for the rescue of the occupants of a burning house in Vancouver, B.C. Both members were conducting drug surveillance on a building when they saw that it was on fire and rushed into the blaze and succeeded in getting all of the occupants out safely.